(Newser) – It was snowing on Feb. 24, 1944, when Jewish children in the French town of Gemeaux were rounded up at their school. Two sisters, Denise and Micheline Lévy, aged 10 and 9, clutched dolls—one pink, one blue—as they were led away to Auschwitz. A gendarme grabbed the dolls and flung them to the ground, Le Parisien reports, via the Telegraph. A shopkeeper picked them up and gave them to the grandmother of Frédérique Gilles, a 38-year-old schoolteacher, who has now donated them to the Shoah Memorial, the Holocaust museum in Paris. The dolls were among 200 items put on display Sunday, out of 19,000 objects collected by volunteers. In many cases like the Lévy sisters, they are all that remain of the deported. 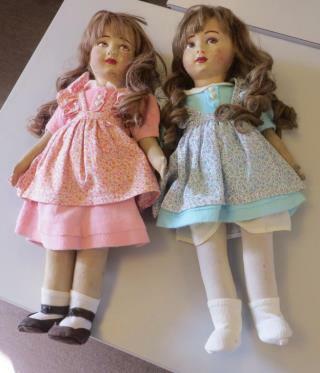 For two generations, Gilles' family minded the dolls. "But nobody ever played with them," she told the paper. "We knew their history." o my I'm just going to puke. There was no holycost, all lies, no gas chambers all lies, no Anne franks diary no 6 million killed all total Zionist BS. Stop torturing us with your fake Jew fairy tales. Can we as a world just rise up and go you lied, ask yourself who owns you? those who won't let you tell the truth. You can't even question these lies without persecution. The math and story's don't add up, all BS. Having given "bushman, abbey, tpvero's plight careful consideration the only logical answer is to swallow the barrel and pull the trigger. Go ahead find the peace that has alluded you.